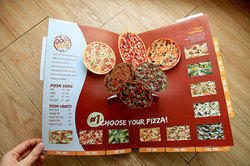 We are the service provider of Menu Cards Printing. 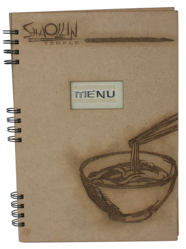 Menu is card is yet another very interesting item we do. We do great variety of Menu cards from paper, to rigid pvc, acrylic, wood and more. Menu cards is not only about printing, there is so much value added elements being incorporated into menu cards for getting identified as a brand. Innovative menu cards are getting more and more popular these days. Menu cards is not just a utility item, hotels / restaurants / fast joints are greatly exploring it for branding. We have complete digital sampling and enhacement systems which gives you great products in short quantity, menu cards is one of them. Our scodix ultra pro digital foiling and uv system can directly print foil and uv on menu cards with pin point accuracy. This greatly enhances the look of menu cards. Through this digital foiling and uv system the client gets the output fast as there is no need to make any molds or dies for printing foil on menu cards. Traditional foiling was done on menu cards through hot foiling method and uv was done through screen printing method, for both this method lot of time is consumed in making dies and screens. This time wastage is negated by using Scodix Ultra Pro. We have a direct computer to machine foiling and uv system which works like a normal digital machine. Gold and silver foil can be instantly printed on menu cards or any other item without any delays. Previously clients with small quantity had to additionally invest in dyes and screens which added to the cost of the product. Than they had to preserve these dies and screens for future use, which they were not sure when would they require. In our case, the client just need to supply us the original artwork and the separation file (same as the old system of separation). And we print it directly. As simple as it is said. 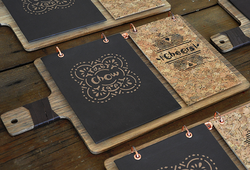 Than our laser machines helps us make menu cards on substrates like acrylic and wood. Combination of such foling / uv / laser and other technologies just gives out a terrific product. It never happened that somethin good was made just like that. Something good came as a output only when somebody understood about various materials, processes, design concepts and how to blend all these together to give a great product. Once our clients knows us and trusts us, they always keep coming back for more innovative products. Different types of customers have unique ideas and want to execute it fast. And we have all the technology and expertise for making it fast. 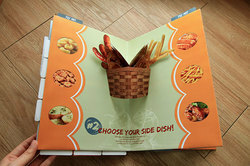 Menu cards on non tearable and rigid pvc makes it durable and protects it from spill overs. All printing companies do not have ridid pvc facility through digital process. Our clients can even add fragrance to their menu cards especially serving juices and desserts. If you are sending menu cards to your fixed corporate clients than we can even print names of these companies over menu cards using the foiling process. Most of the time the menu cards are very creative or innovative which requires cutting them in various shapes and forms. Our laser machine team have great expertise in making such precisely cut menu cards or any other items. So if there is any requirement for printing menu cards than please do reach us and we will be glad to serve you. You can also reach us for printing any other items like diaries, calendars, catalog, stickers, certificates, posters for your hotels, restaurants and food joints. Printing services offered by us is very unique and we focus on how we could differentiate our clients brand literature / collaterals or any printed utility items like menu cards. This was the reason we bought Scodix Ultra Pro - A direct computer to machine foiling and uv system.